Billups became an unrestricted free agent when the Pistons declined the second and final year of a contract option that would have paid him $2.5 million next season. The five-time All-Star had interest in playing with LeBron James and the Cleveland Cavaliers after a workout this offseason and said he had "a couple of opportunities to play" if he wanted to continue. But after missing 185 games the past three seasons, Billups decided it was time to retire a little more than two weeks before his 38th birthday. "It's just time. I know when it's time," Billups told Yahoo Sports. "My mind and my desire is still strong. I just can't ignore the fact that I haven't been healthy for three years. I can try again and get to a point where I think I can go, but I just can't sustain. Me not being able to play the way that I can play, that's when you kind of know it's that time. "It's just time. I'm happy, excited. The game was very, very good to me. I felt like I was equally as good to the game the way I played it and the way I respected it and the way I carried myself through the process." Billups was best known for his first stay with the Pistons from 2002-08. He earned the nickname "Mr. Big Shot" for his clutch shooting when he led Detroit to the 2004 NBA championship and another Finals appearance in '05. He was part of the Pistons' star foursome that also included Ben Wallace, Rip Hamilton and Rasheed Wallace. Billups said the "best memories" of his career were with the Pistons. "Before that, my career was in jeopardy in a few different stages," Billups said. "I persevered, sustained and continued to work hard, and finally got my opportunity in Detroit, and I never turned back from that point. That's what made it so sweet to me to win a championship after what I went through. I had to scrap and fight to get through it and to reach the pinnacle made it even sweeter. "Winning the championship was the ultimate. I never set out to win the [Finals] MVP. Winning the championship was enough." Billups was the third overall pick in the 1997 NBA draft by the Boston Celtics, but was traded to the Toronto Raptors on Feb. 18, 1998. The Denver native turned his career around with the Minnesota Timberwolves, helped lead the Denver Nuggets to the 2009 Western Conference finals in his second stint with the team, rejoined ex-Nuggets teammate Carmelo Anthony with the New York Knicks and played alongside Chris Paul with the Los Angeles Clippers. Billups averaged 15 points, 5.4 assists and made 38.7 percent of his 3-point attempts during his NBA career. He made the All-NBA second team twice, the All-NBA third team once and the All-Defense team twice. He finished with 15,802 points, ranks 39th all-time with 5,636 assists and sixth with 1,830 3-pointers made. He also had 1,051 steals in his career. "I wanted to be one of the best players of my era at my position," Billups said. "And I did that and I earned that. No one gave that to me. I earned every single thing." The Denver George Washington High graduate was a four-time Colorado all-state first-team selection, was Colorado Mr. Basketball three times and was selected to the 1995 McDonald's All-America Game that he missed because of a shoulder injury. Billups averaged 18.5 points per game during two seasons at Colorado. He was a 1997 All-Big 12 Conference first-team selection and led Colorado to its first NCAA tournament win in more than 30 years in 1997. Colorado retired Billups' No. 4 jersey in 2004. "I put my whole life into playing basketball," Billups said. "I started at 10 years old. My goal in middle school and high school was just to go to college. I didn't feel like my parents could afford to send me to college. In fear of not achieving that goal, I had to work harder. I felt like basketball was my way of going to college. "Obviously, you get to college and you re-evaluate your goals and I wanted to go to the NBA. I didn't know it was possible, but that was my goal." Billups was a member of USA Basketball's gold-medal 2010 world championship team. He was the winner of the NBA's 2008 J. Walter Citizenship Award and also was the inaugural winner of the NBA's Twyman-Stokes Teammate of the Year Award in 2013. Billups' entire basketball resume could make the Naismith Memorial Basketball Hall of Fame one day. "The Hall of Fame would be a big dream," Billups said. "It marks you down as one of the greatest players ever. It's not what I shot for, but that would absolutely be a dream. I know in my heart I had a Hall-of-Fame worthy career. If you look at most Hall of Famers, I don't know how many of them started off the way I started off and made it to the top. "I don't know what will happen. I do feel I had a Hall-of-Fame career. But there have been a lot of Hall-of-Fame careers other than me." The early part of Billups' NBA career was marred by injury problems, as was the end of it. He suffered a season-ending torn Achilles' tendon after playing just 20 games for the Clippers during the 2011-12 season and he had knee surgery with the Pistons last season in which he only played 19 games. Billups played a combined 61 games his final three seasons. While Billups is retiring, he said his body actually now feels "the best that I felt in three years." "I'm finally 100 percent healthy," Billups said. "I feel great. But the thing is I always told myself that when I retire, one, I want to feel good. I don't want to be walking around limping. I don't want to just go out and play with my guys. I want to feel fantastic. "I didn't want to go back out with the risk of hurting myself after putting in so much work to feel good. Also, my kids are getting older. I got a junior in high school, a freshman in high school and my baby is 8. And you just can't get those years back." 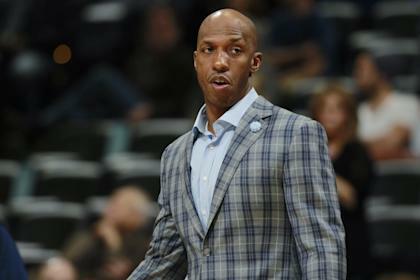 Billups plans on retiring in his hometown of Denver with his wife Piper and three daughters. He has long been respected in the NBA ranks and viewed as having a future as an NBA front-office executive upon retirement, but he says nothing is imminent. He also is considering some TV opportunities that could materialize next season. Billups remains strongly involved in Porter-Billups Leadership Academy in Denver. He also co-owns 30 Wendy's fast-food franchises with former NBA player Junior Bridgeman in the St. Louis area. "Right now, I am kind of taking it easy," Billups said. "I have always said I had a desire to work in a front office somewhere or also do TV commentating or studio work. Those are the things I desire the most. But at the moment I'll enjoying taking it easy. We'll see where it leads."